Busy lives mean that many of us (including this reviewer) don’t have as much time for model-making as we’d like. It’s a market that diecast makers like Corgi have been pleased to provide for, and with new manufacturing processes, it’s fair to say that ready-builts often vie with or even exceed the best efforts of average modelmakers. A case in point is the micro-fine wing rigging now applied as standard in these ranges - it’s a fit-and-finish zone that even the best of us may not be up to. And now Tamiya has entered the ready-built market, using plastic instead of metal. There are advantages with both materials of course, but the main plus for plastic is that it allows for much finer surface detail. And this really shows with the Tamiya 1:48 scale Fieseler Storch (Stork), a widely used World War II-era reconnaissance plane. 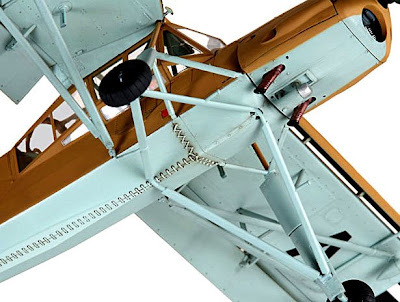 Tamiya’s Storch is the particular plane used by the famed German ‘Desert Fox’, Erwin Rommel. It is depicted with ‘squashed’ undercarriage in the landing position - in flight, the legs extended much further (see bottom photo) which is why it gained its name from the long-legged bird of baby-carrying renown. 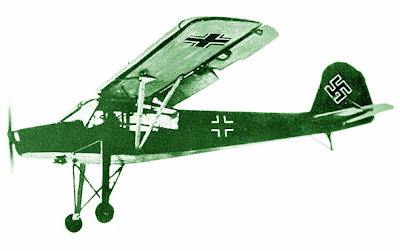 The Storch has a wingspan of 297 mm (11.7 in) and comes complete with seated figures in the glassshouse cockpit: a pilot at the controls, with Rommel sitting behind. A nice feature of this model is the beautifully applied weathering - it’s not overdone at all, with just enough to give the model a used look. Inspect the underbelly pic above to see what we mean. 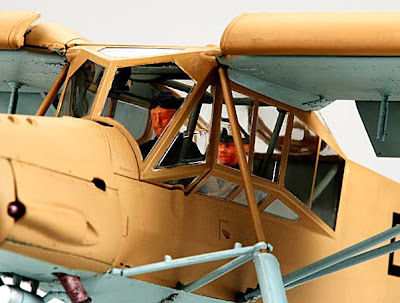 All in all, the Storch is highly recommended for the busy person, and we predict these Masterwork Collection products (there are AFVs out there already) will become a major part of Tamiya’s output in times to come.